Willow House has great home decor products. This is the Galveston Memo Board. You could write an erasable message on it for a loved one, post your holiday menu for a cocktail party, or write a quote you love. Bethany is generously offering one lucky reader one of their very own! This holder retails for $59.96. You will have until Friday to enter. Leave me a comment below telling me what you would write on it if you won! For another entry you can post about this giveaway on your blog, twitter, or face book page. I will be back tomorrow with pictures of my kitchen. I have been making a few changes and can't wait to show you! p.s. don't forget, today is the last day to save 20% in my etsy shop! Love this! I would definitley put my favorite cool quotes and unexpected "happy notes" for family and friends. For this time of the year, I would write, "Let it Snow, Let it Snow, Let it Snow"! Cool give away! A new french word to learn each day! "Choose to be Happy" I love that quote and that is what i would write on it! This would be a perfect size to fit on my kitchen counter, I REALLY hope I win. I love this! I would probably write my honey-do lists on here. I would write "love you always." Everyone should read those words daily. So cute! I would write out a different scripture each week. I would write "La Vita e Bella" (Life is beautiful) which is a phrase I had put on a necklace recently and really like. Can't wait to see your kitchen! I would write simple phrases to help my kindergartener learn to read! Love this! I would write a different scripture each week -- AND menus when we have guests over! I would probably use it to write little notes to my husband to see when he starts his day. How fun! 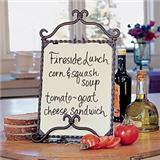 Definitely something for each season or holiday....your chalkboard with Baby It's Cold Outside comes to mind! I'd write a love note to my family each day or have my 5yo write something. Love this! I would write " The best things in life aren't things!" Love your blog and your shop! i would write sweet notes to my boyfriend! I have been bidding on Ebay for one of these for the past few weeks!! "Beef...it's what's for dinner!" --memba that one!? Really lovely! Aside from using it at home to write daily sweet notes of love and encouragement to the family, I'd use it at shows to write little factoids about lavender. So Cute! I would write love notes to my hubby, to-do lists, menu's...lots of things! So cute! I would write my grandmothers much loved cookie recipe on it. LOVE THAT!! We have a saying in our house "DO LESS, LOVE MORE!" It's would be a nice to have it written and remind us everyday what is important!! Love it! It's so pretty. I would write "Love you to the moon and back" first...then, each day, a new something. O, and I have been a follower for a long time. How fun would it be to own this and write good wishes and notes and menus and just about anything!! I would use it to write a welcome greeting to guests. I splurged and bought one of these years ago..as it was being put on the counter for display it was dropped & shattered to pieces. :( I would write daily scripture verses for my family. I typed in a few things I would write on the chalkboard like the kids reminder to empty the diswasher or an inspirational quote. Then I decided this was for me if I won it soooo I would write "MOM'S WISH LIST". Merry Christmas to me !!! Fa la la la la !!! I would write Merry Christmas! I would also write that you are one awesome blog! Loved them when they were Southern Living. They have some unique decor. Love it! Merry Christmas! Thanks for the great give away. Happy Holidays! I'd probably write "joy to the world" or something like that. Something sweet for the holidays would be perfect! I would write the lyrics to a Christmas song... maybe silent night, as a mother of 3 young ones that's what I wish for for Christmas this year! I would write all the love notes to my husband and kids that we write on the chalkboard and the bathroom mirrors. I would write sweet notes to my little girls every morning so as they eat their breakfast they can read something special from their Mum! Also, would be nice to write " Welcome Home" to my Dear Hubby coming back from overseas soon!!!!! What a beautiful memo board! I love it! I would write quotes and at this time of year, Christmasy things!! I have been saving up all those wonderful blog sayings, such as, "Keep Calm and Carry On" and "It Always Seems Impossible Until it is Done". These are the quotes I would be writing each day. I love that! I would write a new quote every day! I would write an inspirational word or phrase to begin each day and display it in our kitchen. Fun giveaway! Love it...little messages to my husband with his morning coffee would be perfect! I would love to win this giveaway....who wouldn't? I would probably write a Christmas message on it. Love this!!! I would put "One Lifetime is not enough for us!" Just posted on my facebook!! Great giveaway! I would probably write notes to myself that I seem to forget. How cute for year round use! I would use it as a countdown for Christmas Day and then cute little sayings afterwards. "DONT WRITE ON MY BOARD!" Thanks for the chance sweetie!! I tweeted about the giveaway (@sarahsmyers). I would write my thankful list on it. Love it! I've always wanted one! Uplifting quotes/scriptures for sure! Right now it would be "Jesus is the Reason for the Season". Oh, I just LOVE this! I would write sweet sentiments to my hubby or holiday greetings. What a neat item!!! I would write happy messages for family, little love notes filled with happiness. I would write, "Have yourself a Merry little Christmas" Love this! I would definitely change it for each season/holiday. It would look perfect on my kitchen counter! Hmmm, I think our "Elf on the shelf" Henry may use it to write notes to my son. After that maybe sweet little nothings to my hubby before I head out to work??? I would say, Cook me up something good hunny. Prize to follow. "Yesterday is gone. Tomorrow has not yet come. We have only today - let us begin." I would write positive reinforcements because there is too much negativity in the world! Oooh that is adorable and would lovely in my future kitchen!! Thanks so much Melaine! I love Willow House! I would write a new riddle or joke each morning for my kids to see before they leave the house! I Love it!! I would leave daily notes to my children and hubby! Love this! I would write little love messages to my DH and my Dinner Menu for the night. I would write "I finally won a blog giveaway!" I love my family and friends. You, are always welcome in my home. I hope our home is a haven for you and that you will always feel safe here. If you need to talk, I'm here. If you want me to listen without judging, I will. Probably because I have middle schoolers. On a particular evening, I would leave a menu. Right now, my kids needs overshadow that and I want them to know it. I would write....uhhh...I can't think of anything right now...but whatever I write will be fun! I would write a Bible verse a week to help me start to memorize. So cute! thanks! I would write "joy" on it as that is my theme for Christmas. Congrats on the new sponsor. One of our dogs is named Willow. I love the name Willow House! SO cute! I'd probably put a cute line from a Christmas song on it. Or a fav Bible verse. Or a fun recipe. Celebrate each day.....and occasional holiday wishes, birthday wishes, inspirational quotes, jokes, menus etc. etc. etc. "If you leave your children unattended....I will give them a cup of espresso and a free puppy!" Being a mother of 3...I saw this in a store and it made me laugh! Looking forward to the unveiling of the kitchen! Love the memo board...I would write inspirational quotes and seasonal messages on it. Oooh, awesome giveaway! I'm a post it note queen, so I won, I'd have to step down from my thrown and start this this beauty to replace my precious post its. I love the idea of writing menus on this! I would write "tonight's menu: Eat out! I hate to cook so I would write silly, Honey, what's for dinner messages! What a great giveaway! I love this. Mine would have reminders like.....Shari, you have so much to be grateful for! Very nice! My daughter Teagan loves when I leave little messages for her around the house so I'm come up with random quotes and notes for her every morning. I would write little notes to my kiddos and husband. this is so cute! love it!. I would write love notes to the hubby before leaving for work or out for a girl's night. We generally don't cross paths much during the day, so we usually just write on our ugly white board in the kitchen. I would write love notes to my family every morning. I would write a note to lovingly remind my hubby & daughter to wash their hands before touching anything in my kitchen. Would love this - great to send love messages to family members! I love that WH Memo Board. So cute. I would write the daily menu or an inspirational/humorous quote on it. PS~Love your new kitchen! The cabinets and floors look awesome! What a great giveaway! I'd write: Life is short. Eat dessert first! I would write a new bible text on there each week. LOVE IT! I would write our menu for the week! I just don't tell my big kids often enough that I love them. They don't live at the "Coop" as they are all grown up and have families of their own and when they come over, its always so hurry, hurry, especially this time of year. So, I would simply write thier names and then say, "your Momma loves you!" love it, great job on your floors! Love you forever and always!